MANILA, Philippines - Vice presidential candidate Senator Ferdinand "Bongbong" R. Marcos, Jr. believes his presidential running mate Senator Miriam Defensor Santiago outshone her rivals in the first presidential debates for 2016 elections held at the Capitol University in Cagayan De Oro City on Sunday, February 21. 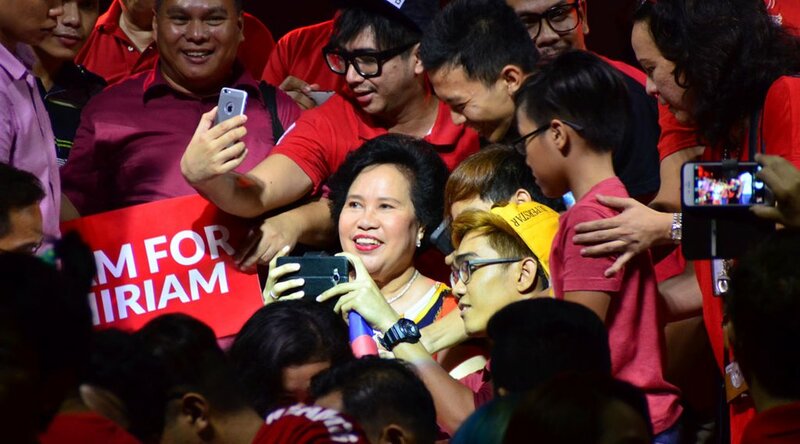 Apart from Senator Santiago, all other presidential candidates took part in the Commission on Election-sponsored debates, including Davao Mayor Rodrigo Duterte, former Interior and Local Government Secretary Manuel Roxas III, Senator Grace Poe, and Vice President Jejomar Binay. "I think she did very well, kagaya ng inaasahan nating lahat. Alam naman nating lahat na pag debate ang pinag-uusapan ay si Senator Santiago ang talagang hasang-hasa dyan at sanay na sanay dyan," Marcos said in an ambush interview during a break on his sortie yesterday in Muntinlupa City. Marcos said it was obvious in the presidential debates that compared to other candidates, Santiago had a deeper appreciation and analysis of the problems affecting the country today as well as the applicable practical solutions. "Ganyan talaga ang ugali ni Sen. Santiago, hindi shallow, hindi peripheral, hindi tangential ang kanyang pag-iisip kundi pinupuntahan na talaga kung ano yung puno't dulo ng problema at yun kagabi ang nakita natin," Marcos said. However, Marcos thinks it would help the voters make a better assessment and comparison of the capabilities of the candidates if in the next round of debates they would be made to answer common questions on specific issues. After consolidating his support in the "Solid North", on the first two weeks of the campaign, Marcos has begun his foray yesterday into the CALABARZON (Cavite-Laguna-Batangas-Rizal-Quezon) area, which the Commission on Election tagged as having the most number of voters in the country at 7.6 million. Marcos is thankful for the warm reception he got from the people of Muntinlupa. Meanwhile, Marcos believes the issue of Santiago's health will not affect their campaign at all. There were earlier calls for presidential candidates to bare their health record, particularly directed at Santiago who had admitted having Stage 4 lung cancer but eventually said she has beaten it. "She's fine. Of course she has a condition that she has to take care of. But other than that, she is handling the campaign very well," said Marcos. "If she says she's okay, I believe that," he added. Marcos also said it's not health but strategic reason why he and Santiago are not oftentimes seen together in campaign sorties, particularly to enable them to reach as many people as possible that they wouldn't be able to do if they would always go together. "Umiikot sya sa mga college. Ganyan naman talaga ang ginagawa ng mga kandidato sa campaign para mas maraming mapuntahan," he said.